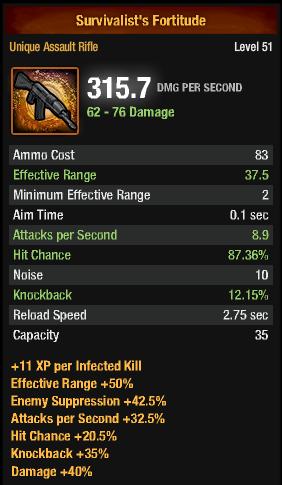 Hey Iwong, is your Minigun +45% aps, +30% damage and hit chance? Here is my little bit, maybe nothing spectacular, but I just wanted to show that the inventory doesn't have to be inflated for no reason. Im level 55 and I defnitely do not have that kind of gear. Updated the OP with lots of new stuff. There's only a few things missing, and then it's on to just collecting counters. hey guys im lvl newb. Does anyone have an Unique Assault Mask in black? I've got khaki and alpine versions, but never seen a black version, yet the wiki lists it. Like this? idk if that's what you mean. The uni is a raid mask, the rare you're showing there is the assault mask, and that's a khaki version. But it would be that one in a black version. Black assault masks don't exist in the game. 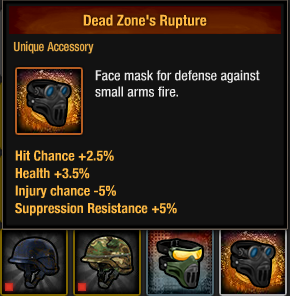 Theres only the premium HERC Assault Mask that fits your description. Unfortunately the wiki is wrong. Thanks for that answer, I didn't think they did.